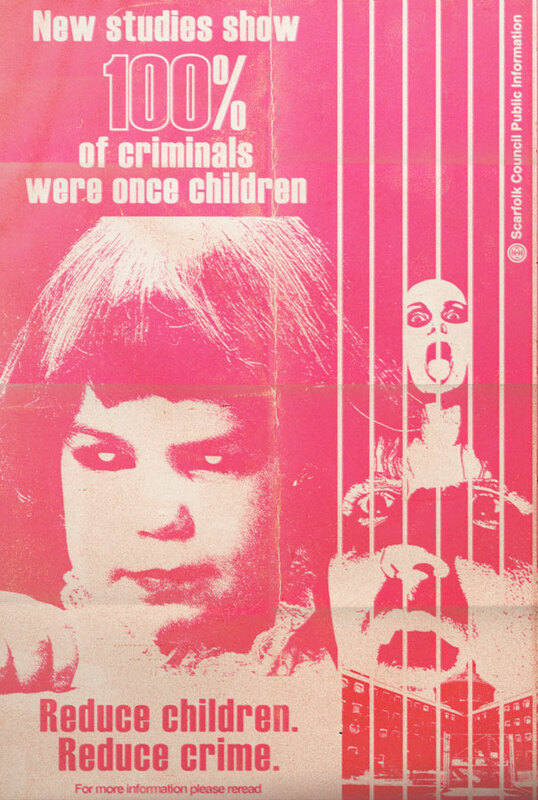 Scarfolk Council: "Children: The Cause of All Crime"
"Children: The Cause of All Crime"
In 1970 the Scarfolk Crime Commission embarked on the largest study into crime to date. After two years of intense investigation it found a startling correlation between the types of people who commit crime and their early life experiences. The findings were unequivocal: 100% of criminals had also once been children. The council immediately put into effect acts intended to reduce, if not entirely eradicate this insidious cause of crime. Thousands of children were rounded up in camps. Toys were burnt in massive pyres. Adults were sterilised. Anyone who had been in regular contact with children, or had ever been a child, was quarantined in vast bunkers specially built several storeys below the council building. Though Scarfolk was reduced to a ghost town, the scheme proved a success. During the first month that these stringent measures had been implemented not one crime had been committed. Consequently, at the 1972 Conference of Sham Utopias, a local conservative MP predicted that the most successful towns, and even countries, of the future will be those that eradicate all citizens who have any connection to, or dealings with, children or the adults they grow into. For more about bad children, see: Brood parasites, Serious Infant Dental Assault, the Never Go with Strange Children campaign and the Infant Liberation Front terror group. Not only do they spread cholera and rabies but it now transpires that they are also the root cause of criminal behaviour. I shall make haste to the nearest turnpike and strangle the first reprobate I encounter. I will of course wear gloves to minimise the possibility of contagion. Thank you for this information. Even worse, it has recently been established that CHILDREN SPREAD CHILDREN. We need to stamp every one of them out before Brexit. Not to mention that all of them liked to walk naked on the streets. They even tries to hide it with clothes !